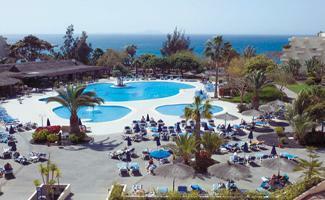 Hesperia Playa Dorada Canary Islands Hotel in Playa Blanca Lanzarote. This Hotel Accommodation by the beach in Canary Islands on the Coast of Spain, has a swimming pool, is close to the beach. Prices from 35.7 EUR. Welcome to the Hesperia Playa Dorada Canary Islands Hotel.Located in the popular resort of Playa Blanca and just a short stroll to the beach, this hotel boasts 3 swimming pools, a tennis court and a fitness centre with sauna and Jacuzzi. For more on this Hotel Accommodation by the beach in Canary Islands on the Coast of Spain please click on the availability buttons above and below. The Hesperia Playa Dorada provides excellent Hotel Accommodation in Playa Blanca Lanzarote, Canary Islands, on the Coast of Spain. The address is Urbanizacion Costa Del Papagayo, Playa Blanca , 35570.